The chance encounter stuck with him. Leaving school for a semester, Luke traveled back home to Minnesota and started developing a college application guide that was compiled freely online with 200 rural high school counselors to address common snags for students in the application process. “Where you’re born or who you’re born to shouldn’t influence your opportunity to get into college,” was Luke’s mission. Cole Scanlon joined forces early on with Luke, driven by similar personal experiences. The son of a high school English teacher and grandson of a high school counselor, education was always a priority growing up. But when it came time to think about college, his urban public high school in Miami, Florida had 900 students for every counselor. Many students at his high school were confused about how to fill out financial aid forms, didn’t know how to find free resources to study for standardized tests, or where to find scholarships. Now a senior at Harvard College studying applied mathematics, Cole has continued to pay it forward. Throughout his time at Harvard, Cole has mentored students from his high school by sending them a list of scholarships he applied to and reviewing their college essays. The common information gaps that both Cole and Luke encountered - about how to apply for and afford college - demanded a comprehensive remedy. Pulling together an all-volunteer group of 20 college students and 250 high school counselors, Cole and Luke started Fair Opportunity Project, a nonprofit organization dedicated to empowering students to access and afford college. Together, the group compiled free resources for applying to college: resources like successful college essays, free online videos, scholarship websites, and more. They assembled a strong advising team including Michael Brown (CEO of City Year), Richard Barth (CEO of KIPP Schools), and Katherine K. Merseth (Founder of Harvard Teacher Fellows Program). The resources were enriched by countless suggestions from experts in the field. They developed Spanish and Mandarin versions, expanding the reach to many others. The finished product was The Guide, a 70-page free resource that covers the entire college application and financial aid process from A to Z. The Guide has been downloaded in every state and in over 200 countries. Their website receives thousands of visits every month. Fair Opportunity Project has been featured in Thrillest, Harvard’s SEAS, and the Harvard Ed Magazine. Cole and Luke were recognized in Forbes 30 Under 30. “We’re hustling and fighting to get The Guide to every high school student in the US; to get students the information necessary for them to put their best foot forward,” said Luke, when describing the project. 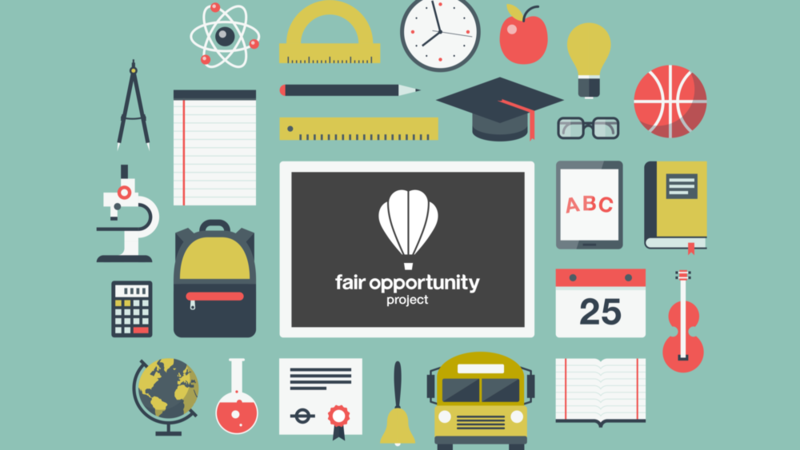 Moving forward, Fair Opportunity Project is focused on furthering the impact of The Guide. The team is seeking funding that will allow them to focus on expanding and updating The Guide with additional content. Data and feedback from the first round of distribution has revealed still more about the information gaps. In development are additional innovative approaches for getting the information in the hands of students. Every student. Get a Fair Opportunity. Give a Fair Opportunity.